The “publication section” of this website as been updated with two new downloadable documents, currently only available in french. Understanding exactly what is detected by amateur stations at VHF using passive radar techniques is not an easy task. Doppler plots show interesting features that are quite difficult to connect to underlying physics : sometimes starting with very fast decaying Doppler, plots are mainly containing spread signals at low Doppler shifts. Following figure summarizes what we think is observed. Each of the 4 phases are commented in the (french) document you can download in the “publication section” or directly by following this link. Based on several thousands of observations during several important showers over past years, we got convinced that amateur stations do not offer sufficient gain (or sensitivity) to be able to see head echoes. Integration time used to compensate the limited gain limits processing capabilities to estimate meteor speed, specially in the early phase when the object is entering the atmosphere. The main outcome of this study is that we think what is usually called “head echo” by many amateur observers is most probably just a specular reflexion, leading to apparent fast motion and high energy level. These are only preliminary conclusions and you are welcome to get in touch with us if you have questions or comments. 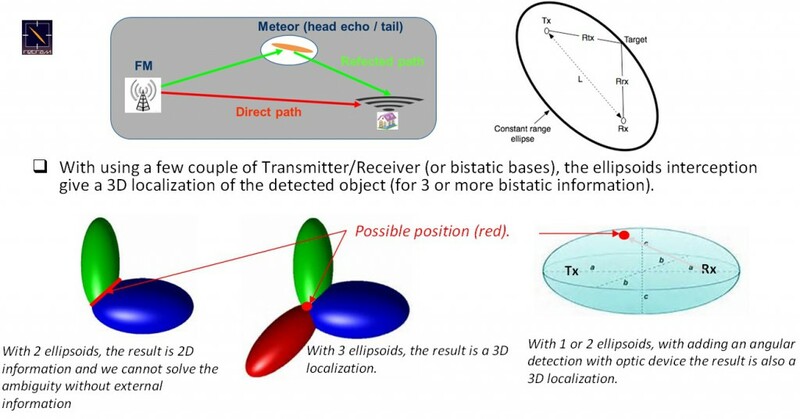 Many people are interested in detecting meteors using radio techniques. They generally use narrow band transmitters or beacons transmitting in VHF band. As these transmitters are progessively turned off, other solutions have to be investigated. RETRAM tried other sources : VOR and FM broadcast. The project page has been updated and gives a more detailed description of the way we process the signals. 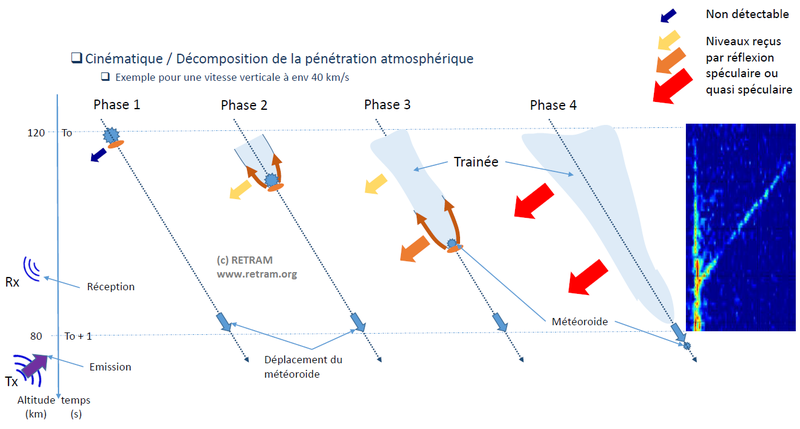 Work done at RETRAM was presented in two conferences since september : The International Meteor Conference 2014 (Giron – France) and the IEEE Radar Conference 2014 (Lille – France). You can now access the papers from the updated publication page. For the next IMC 2014 conference (see official website http://www.imo.net/imc2014/), RETRAM proposed a poster and submitted a paper explaining the FM passive radar technique we use. Thanks to the BOAM team for their support.